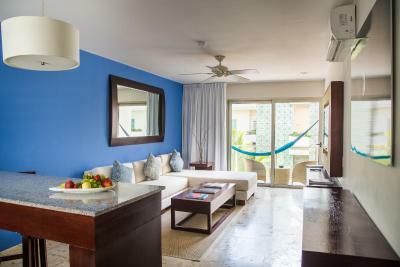 Lock in a great price for The Palm at Playa – rated 9 by recent guests! The breakfast was delicious. The location was perfect. The rooftop was beautiful. The layout of the room was nice except the shower area needs doors. The vibes and the design.. I liked the room a lot very big..
Nice property, close to everything, great pool, good breakfast with great serving staff. Spacious comfortable rooms, enjoyed the room patio. The first night we were there, the outside street noise did not stop until 3:30 AM, and majorly disrupted our sleep. We complained to the front office and to Sandra, the Concierge. They said they'd see what they could do. Later that day they said they had another room if we wanted to change. We did, and couldn't have been happier. Better room (upgraded), and quiet, peaceful nights. Excellent customer service!! They definitely aim to please! I liked the room. Extremely large with a great mini bar, excellent bed and pillows. loved the rooftop pool and bar, awesome staff. This is the second time staying here and will return soon. I would recommend it for sure! The front desk staff was welcoming, brought us our 'genius' beverages right away, got us set up with someone to take our bags up and explained how things would work for our stay regarding breakfast and other amenities. The room was spacious, with two different rooms. One with a bar for eating or whatever, fridge, coffee maker, sink. The other the bedroom area with a large balcony and great view of the interior garden and seating area. Sandra, the concierge was the best!! The Palm at Playa This rating is a reflection of how the property compares to the industry standard when it comes to price, facilities and services available. It's based on a self-evaluation by the property. Use this rating to help choose your stay! The Palm at Playa features a rooftop terrace with a swimming pool, bar, spa and gym. It is located just 4 blocks from Playa del Carmen town center and a 2-minute walk from the beach. The hotel has access to 4 private beach clubs. This hotel offers free Wi-Fi and air-conditioned rooms with modern-style décor, flat-screen cable TV and garden or street views. The room rate includes free American breakfast. Breakfasts at Sabor a Mar are a delight while LOVE Restaurant serves international cuisine and unique flavors, with outdoor seating on the terrace. The front desk at The Palm at Playa is surrounded by a tropical garden designed resembling the Mayan Jungle. The Palm at Playa is just 650 feet from the famous Coco Bongo bar and a 15-minute drive from Xcaret Eco Theme Park. 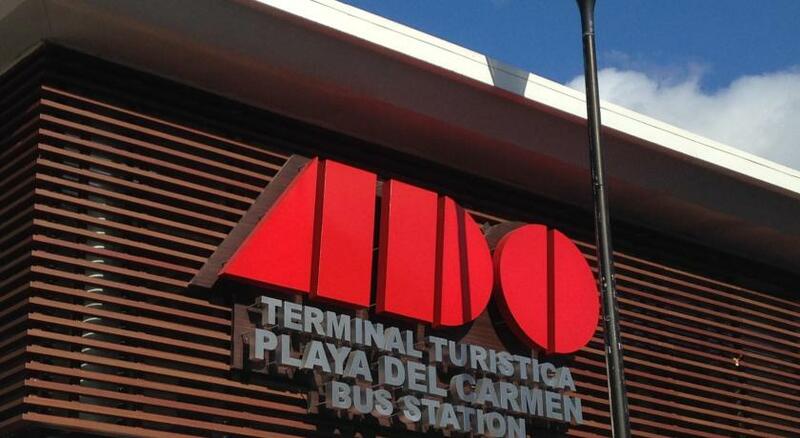 Cancun International Airport is 40 minutes’ drive away. 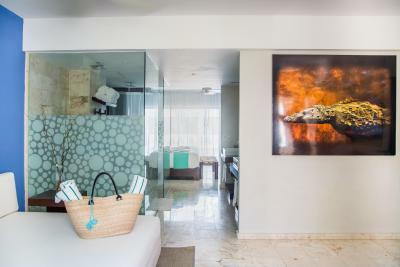 This is our guests' favorite part of Playa del Carmen, according to independent reviews. When would you like to stay at The Palm at Playa? This loft with a self-contained interior features free Wi-Fi, a living room with sofa, flat-screen satellite TV and a balcony with courtyard or street views. This suite features one private bedroom with bathroom free Wi-Fi, a living room, a fully equipped wet-bar, flat-screen satellite TV and a balcony with courtyard or street views. This room features free Wi-Fi, air conditioning and flat-screen cable TV. This quadruple room has air conditioning, mini-bar and cable TV. The bedrooms are totally independent: King size bed in the master bedroom and 1 sofa bed. The adjoining room can have king-size bed (subject to availability) or twin beds. We are a boutique hotel with the style of Playa del Carmen with a design Lifestyle-beach for adults only, a crowded place attitude, positive energy and style, you can visit our terrace the Roof Club, this is considered one of the 5 "more Cool Roof Top of destiny" with a vibrant pool and Jacuzzi which is distinguished by having the best ocean views in all of Playa del Carmen, also you can enjoy the best sunsets as well as being the perfect place to start the night with international DJs music, while you try a variety of international cocktails. House Rules The Palm at Playa takes special requests – add in the next step! The Palm at Playa accepts these cards and reserves the right to temporarily hold an amount prior to arrival. Please note that this hotel is oriented for adults and children over the age of 14. Honeymoon special amenities available upon request and proof of marriage. Available once per couple and only with documents of proof of marriage. Please contact the property for more information. Parking spaces are subject to availability. Air conditioner leaked upon arrival, but staff were quick to fix it. The bed wasn't properly made, as the sheet didn't fully cover the mattress at the foot or the comforter. Staff were exceptionally nice and helpful. The surrounding businesses are very noisy at night (which was expected in downtown Playa); music on both sides until 4am. In our bedroom with the air and fan on it wasn't very loud, but much louder in the living room. Bed was super comfy. Breakfast was good. Room was big and really high quality. Staff were excellent! They offered me an upgrade which seemed like a nice perk but they happened to upgrade me into a street view room and it was IMPOSIBBLE to sleep. The nightclub across the street would play really, really loud music every single night from 11pm and until 6am, when I was able to get some rest. The room does not have shutters nor screens, just curtains and this does not prevent the noise at all. Overall, really nice hotel but make sure you request non-street facing room. Staff was really helpful, the hotel itself is really nice and well located. There were nice touches throughout the room. Great service of very friendly staff! The breakfast was really good. We had a loft on the 3rd floor with garden view which was super quiet. The balcony was huge with a hammock and the sun was there until late 👍 The best part is the rooftop pool with a relaxing atmosphere and a jacuzzi to warm up afterwards. I would highly recommend this hotel if you can get a room away from the party street. During my second stay I got a loft on the first floor to the street. It was super loud until 5am and I hadn’t had any sun on my terrace also no hammock like the other rooms have. The breakfast was very good. The lofts/ suites in the upper floors are very nice. The rooms are beautiful, very clean and comfortable. The staff is nice and accommodating. Location is perfect! Great hotel with clean rooms and really nice bathroom. Pool was perfect. Very friendly staff, especially Sandra the conciërge was very friendly and helpfull. Location is also prefect! We can recomment this hotel.